Yesterday was the Como Lake Presbyterian Church Annual Christmas Bazaar. I look forward to going each year. Baked treats, thrifted finds, holly branches and plants, home crafted Christmas decorations and knitted/crocheted/sewn items. Time to talk to the ladies and gentlemen who host, a precious glimpse of past traditions that contrast sharply with the the reality of the world today. I put my holly in my Mom's old vase. Happy Thanksgiving to my American Blogging Friends. Joy - Love the holly in that beautiful vase. Have a great week! The holly arrangement looks perfect in the pretty yellow vase. Have a great holiday. I like your holly in the vase and those church sales are great fun and full of treasures. I love bazaars but haven't been to one in years! I don't know if I just haven't noticed any or if we just don't have them here like we used to. I don't have holly - or at least the kind that has berries! Wish I did!!! 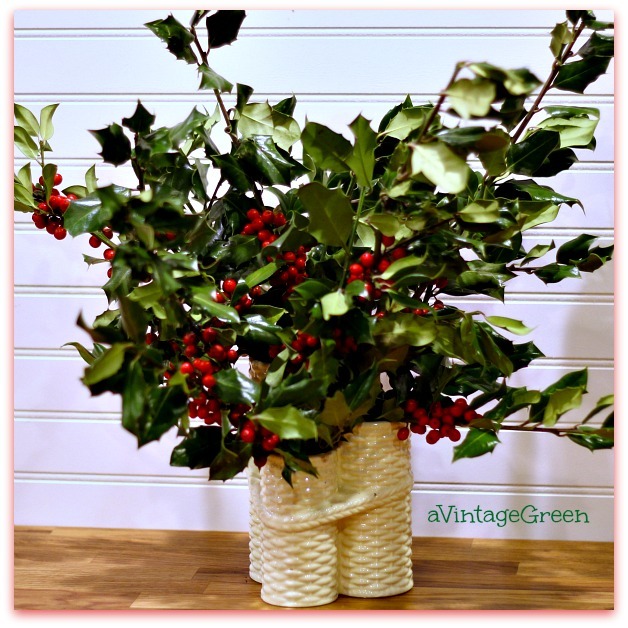 I love the holly in the vase. My sister is supposed to bring me some tomorrow. I'm looking forward to making a bouquet of my own.